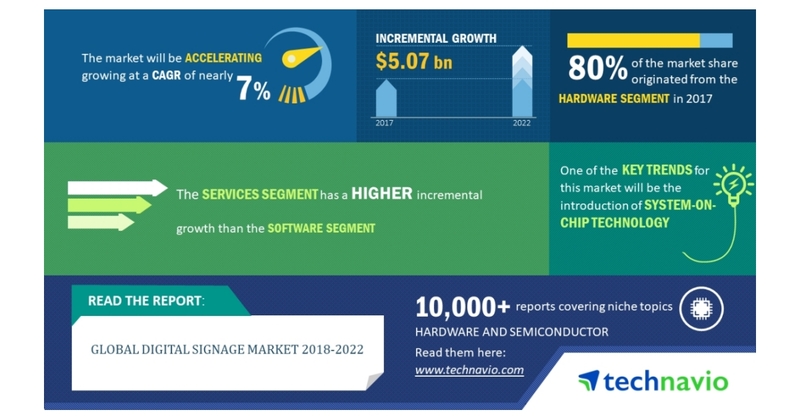 LONDON–(BUSINESS WIRE)–According to the global digital signage market research report by Technavio, the market will register a CAGR of close to 7% during the period 2018-2022. One of the key factors driving the growth of this market is the high growth of the retail space. The increase in the demand for consumer goods has promoted the growth of the retail industry, which has led to retailers expanding their market presence. Factors such as the increasing urbanization, growing household incomes, and the rise in demand for quality products have been contributing to the high growth of the retail sector. This global digital signage market research report provides an analysis of the most important trends expected to impact the market outlook during the period 2018-2022. Technavio classifies an emerging trend as a major factor that has the potential to significantly impact the market and contribute to its growth or decline. SOC is an emerging technology, which is being employed in the manufacture of smartphones, tablets, and commercial displays. SOC allows the integration of key processing components on a chip. This reduces the requirement of components in the digital system. As the SOC technology can be fitted with commercial display systems, it can substitute multiple equipment such as media players used in digital signage systems. “The reduction in hardware and installation costs are some of the advantages offered by SOC technology in digital signage. In addition, SOC allows the easy development and update of digital content and applications for digital signage systems. Smartphones and tablets can be used to create the content and it can be easily updated on the digital signage system using SOC,” says a senior analyst at Technavio for research on displays. This digital signage market analysis report segments the market by product (hardware, services, and software), application (retail, QSR and restaurants, education, and healthcare), and geography (the Americas, APAC, and EMEA). The hardware segment held the largest digital signage market share in 2017, accounting for nearly 80% of the market. This product segment is expected to dominate the global market throughout the forecast period. The Americas led the market in 2017 with almost 55% of the market share, followed by EMEA and APAC respectively. The Americas is expected to dominate the market throughout the period 2018-2022.